I had some bananas that needed to be eaten. 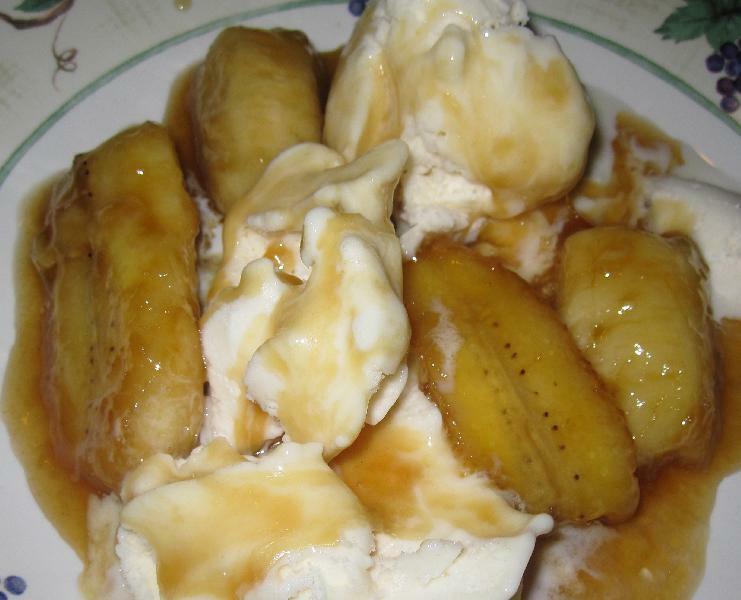 I thought about all the desserts that I could make using bananas and then thought of one of my most favorite desserts - Bananas Foster! I never knew how easy of a dessert it was to make. This was so delicious. It reminded me of one of my favorite desserts - bread pudding from 'Ohana at the Polynesian at Walt Disney World. I decided not to add the rum even though I had it on hand. I tend to be very accident prone in the kitchen. If I burned myself my husband would have been very upset. I found the recipe here. I decided to cut the recipe in half, as I had some very large bananas. That didn't seem to work very well. So I adjusted the amount of butter and came up with this. Melt the butter over medium high heat. Stir constantly to prevent burning. Add the brown sugar to the butter. Stir constantly. Cook for 3-5 minutes. When the consistency resembles maple syrup turn the burner to low. Next put the bananas into the butter/sugar mixture. Allow the bananas to soften. Make sure that the bananas are completely coated by the mixture. Finally add the vanilla extract. Stir into the mixture. Place over vanilla ice cream and enjoy! Description: A decadant dessert that is very easy to make! anonymous : This is my favorite dessert.